September 11, 2012 - A former airline employee was sentenced to 18 months in federal prison Friday after smuggling more than $150,000 on a commercial carrier from Philadelphia International Airport (PHL) to the Dominican Republic. The sentencing comes after an investigation by U.S. Immigration and Customs Enforcement's (ICE) Homeland Security Investigations (HSI). Juan Adames, 29, of Ridgefield Park, N.J., pleaded guilty to bulk cash smuggling and other related charges in June 2012. Adames was arrested in August 2010 after failing to declare approximately $153,000 to customs officers in the Dominican Republic. After his arrest and seizure of the funds, customs officials in the Dominican Republic released Adames and notified HSI special agents who subsequently began an investigation. According to the investigation, Adames used his position as a commercial airline employee to circumvent federal screening procedures at PHL before reaching his destination. When he returned to the U.S. in January 2012, he was arrested by HSI special agents and charged. "A major vulnerability was ultimately identified and closed as a result of this case," said John P. Kelleghan, special agent in charge for HSI Philadelphia. "We simply will not allow individuals working in and around commercial aircraft to exploit their positions for criminal ends. Through the cooperation of our domestic and international law enforcement partners, we will continue to ensure the safety and security of the flying public." 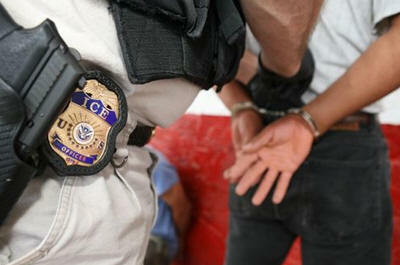 As part of the effort to combat bulk cash smuggling, ICE established the National Bulk Cash Smuggling Center (BCSC) in 2009. Since its inception, the center has initiated 474 criminal investigations, which have resulted in nearly 270 criminal arrests and the seizure of more than $170 million. The BCSC is an operational, intelligence driven investigative unit with the mission to challenge bulk cash smuggling from both national and international perspectives. The BCSC is focused on the disruption of facilitation pipelines used to move currency derived from illicit activity including drugs, weapons, human trafficking, foreign political corruption and contraband.